Did you know that on November 10th Sesame Street will be turning 45 years old? I was completely shocked when I heard that. I can remember watching Sesame Street when I was growing up, and didn't even realize it had been on for so long before then. Looking back I thought it was something that came out when I was a kid. I even watched it with my two kids and remember talking to them about how it had changed from my era to theirs. It's one of the few shows that changed, but not in a bad way over the years. It's always had a great way of teaching kids lessons in a fun way that keeps them interested. To help celebrate this momentous birthday celebration in conjunction with TV Store Online I'm hosting a giveaway for some awesome Sesame Street apparel! TV Store Online has a great selection of officially licensed apparel for the whole family. Win it: 2 lucky readers will each win their choice of Sesame Street T-shirt. This giveaway will end November 18th at 12:00 am EST. The winner will have 48 hours to respond to my email. If no response, a new winner will be chosen. Open to residents of the US. My favorite character is Grover! 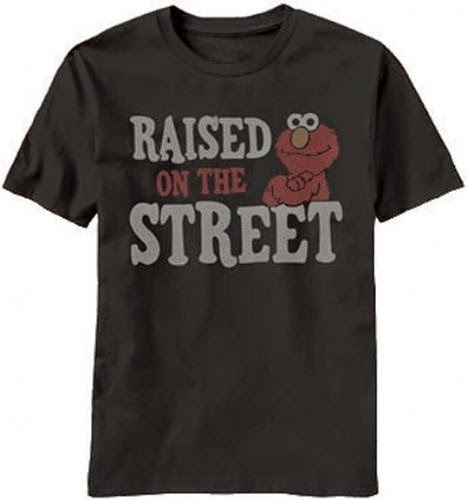 Elmo is my favorite character! Cookie Monster is my 'spirit monster', but my fav is lovable, furry old Grover! My favorite sesame street character is oscar! I love Elmo but my sons are obsessed with Oscar the Grouch. I have always like Cookie Monster, but my boys like Elmo. Mr.Snuffleupagus- of course now everyone can see him. Bummer! Cookie monster has always been my fave! I love the Count and Oscar. My favorites are Bert and Ernie. I was always a Kermit fan! I loved Big Bird, he was my favorite. We like Cookie Monster and Oscar is a close second! I like the two old guys in the balcony-whatever their names are. My favorite was Oscar the Grouch. i have always been a fan of the count though i love oscar the grouch too! My favorite character is Big Bird! I love Oscar and Elmo! Thanks so much for hosting this giveaway! My favorite sesame character is Elmo!!!! I love him!!! My favorite Sesame Street Character is Oscar the Grouch. I've always loved Cookie Monster, Oscar the Grouch, and Bert & Ernie...I'd be hardpressed to pick just one time all time fav! 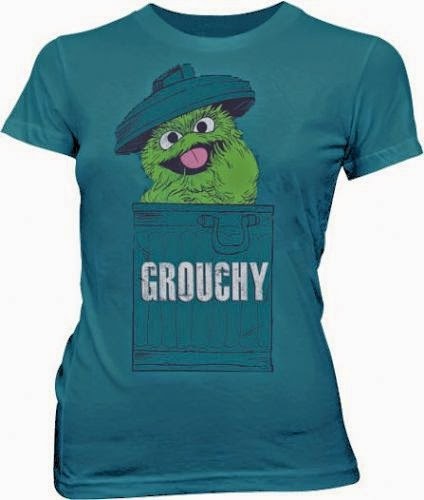 I LOVE that Grouchy shirt...and Oscar is my favorite character. Cookie Monster all the way! My favorite Character is Elmo or Snuffy!! Oscar is the best - can you guess which t-shirt I would want? LOL It's great! My favorite is the cookie monster!!! My favorite character is Grover. I especially like it when he's Super Grover. I also love Baby Bear. My favorite character is Elmo. My favorite has always been Oscar the grouch. My favorite is Big Bird. I liked Big Bird as a kid. I love Cookie Monster! and Kermit the Frog! and Bert and Ernie! I love them all. I grew up watching Sesame Street and have my favorite clips. The opera-singing orange. The numbers pinball machine. My favorite was always Grover.